This production line fits for producing knotless net sequentially and automaticly for once extrusion molding; barrel net,flat net,stretching net,fine soft and tensile net with different materials and specs can be produced. Such as wine packing net,vegetable packing net,plastic net bag,bathed ball net,garlic packing net bag,toy mesh bag,bud and bottle protect sleeves and marine products net,etc. 1.The variable frequency drive motor which has high speed control precision,wide adjusting range,low energy consumpution and reliable operation. 2. 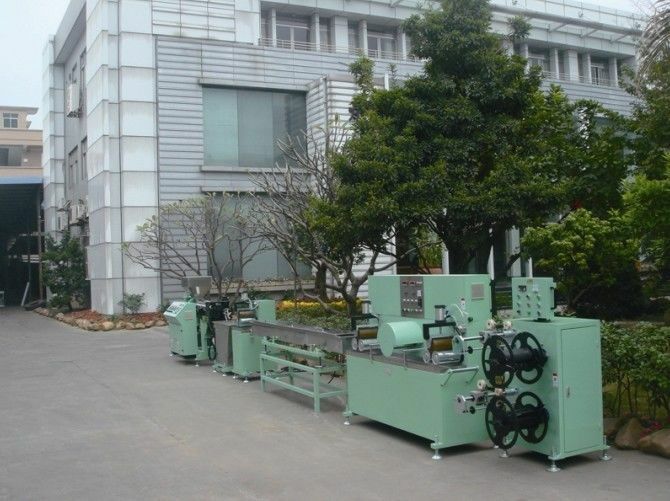 The screw and barrel of extruder adopt the 38CrMoALA nitrogen treatment so as to prolong service life. 3.Adopting far infrared energy saving heater intelligent digital automatic tempreature controller which has high efficiency and low consumption. * Specification are subject to change without notice due to constant research and development.